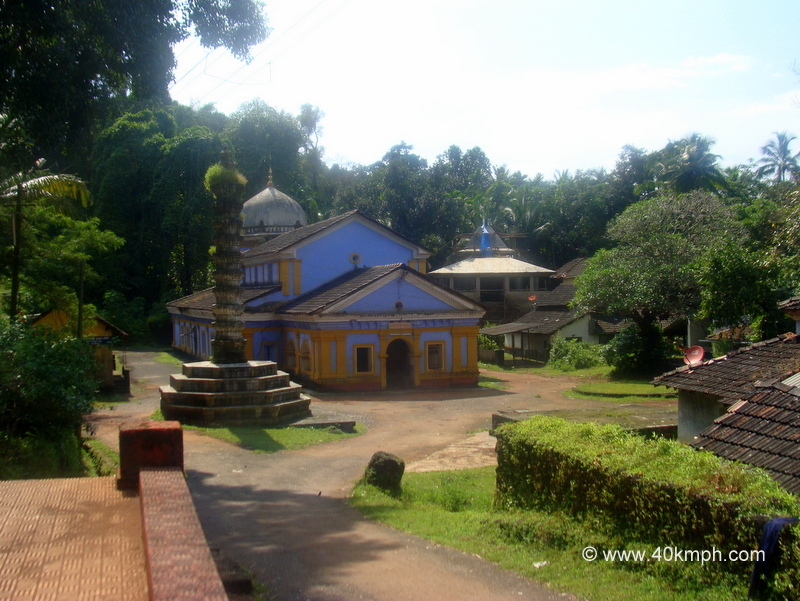 Shri Saptakoteshwar temple, Narve is in Bicholim taluka of North Goa. Since weeks wish was to visit though it is far by-road and a thought within – maybe a shortest route possible. I inquire at a restaurant close to Gandhi circle, Old Goa and finally on the way towards Mandovi river (Viceroy’s Arch – landmark) to catch ferry. Ferry ready- I along with motorbike crossing. Beautiful it is. first time in life within an island – WoW – said I. Few seconds/minutes for self-talks and to believe and towards Narve jetty which is on the other side of Divar island. The motorbike – The start – The wide green fields and I riding in-between. 2 km ride and a shop. Narve jetty? Right-turn – go straight – follow the road – said the shopkeeper. Lions Club of Divar, the Bus-stop – A landmark (500 meters of drive) and straight drive again. Finally after 5.5 km of total driving within almost no man visible land/old Portuguese home I was at Narve jetty. The ferry was on the way – I have to wait. Few head-turns to watch the beauty around…fantastic. Mandovi river again. 5-7 minutes journey and I at Narve. A small shop present and The query: Saptakoteshwar temple? Follow the road – follow the display-Board. 4 km drive (Archeological display-board displaying direction) and Shri Saptakoteshwar temple- Lord Shiva temple. Motorbike parked and I walking towards the temple. Golden silence existing. Few minutes had talks with God – immense peace within. After weeks of wish to visit finally fulfilled. They say: God’s wish and We visit. Prayers!!! On the way back. Crossing madovi river from Narve- riding within the Divar island and Divar jetty and Old Goa again. If you are within Goa or having plans to visit you should follow this shortest scenic route. While returing from Divar island I can watch Old Goa churches. Beautiful to watch. Divar island itself is very memorable for a drive.